The Diamondback is based on Ramcat's patented Airfoil System found on the ferrule. This concave design reduces wind planning, leading to Ramcat's renowned field point accuracy and market-leading penetration. The Diamondback is Ramcat's first entirely fixed blade featuring a 1-1/16" cut diameter, Firenock Aero Concentric Technology and Back-Cut Technology. Hits like a Ram, Cuts like a Cat! The Diamondback is based on Ramcat&apos;s patented Airfoil System found on the ferrule. This concave design reduces wind planning, leading to Ramcat&apos;s renowned field point accuracy and market-leading penetration. The Diamondback is Ramcat&apos;s first entirely fixed blade featuring a 1-1/16" cut diameter, Firenock Aero Concentric Technology and Back-Cut Technology. Hits like a Ram, Cuts like a Cat! The rear of the blades are sharpened. lf there is no pass through, the blades roll forward and cut coming out. Blades are .032" stainless steel and silent in flight. The patented concave scoop design creates an airfoil that eliminates wind planing for field point accuracy. 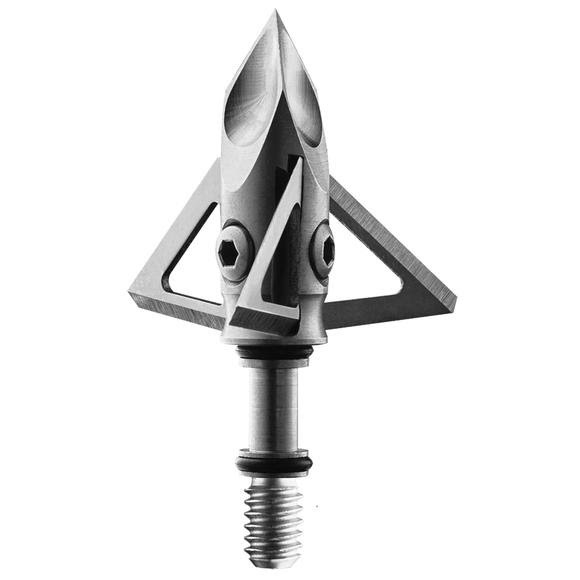 On impact, the airfoil science of Ramcat continues to work by moving body mass outward and away from the broadhead body and arrow shaft.